CNG: eAuction 442. Lot of three (3) coins. 442, Lot: 14. Estimate $150. Sold for $95. This amount does not include the buyer’s fee. Lot of three (3) coins. 14a Valerian I. AD 253-260. Antoninianus (21.5mm, 3.53 g, 5h). Rome mint. 1st issue, AD 253-254. IMP C P LIC VALERIANVS AVG, radiate, draped, and cuirassed bust right / FIDES MILITVM, Fides standing left, holding standard in each hand. MIR 36, 22d; RIC V 89; Cunetio 441. EF. Bought from Baldwin's, 1993. Ex Glendinings (7 July 1993), lot 11. 14b Valerian I. AD 253-260. Antoninianus (21.5mm, 3.33 g, 6h). Rome mint. 1st issue, AD 253-254. IMP C LIC VALERIANVS AVG (sic), radiate and draped bust right / FIDES MILITVM, Fides standing left, holding standard in each hand. MIR 36, 22d var. (obv. legend); RIC V 89 var. (same); Cunetio 441 var. (same). VF, toned, red deposits. Bought from C. J. Martin (Coins) Ltd., 1982. An example of a die-sinker’s error in the obverse legend. 14c Valerian I. AD 253-260. Antoninianus (22mm, 3.82 g, 5h). Rome mint. 1st issue, AD 253-254. 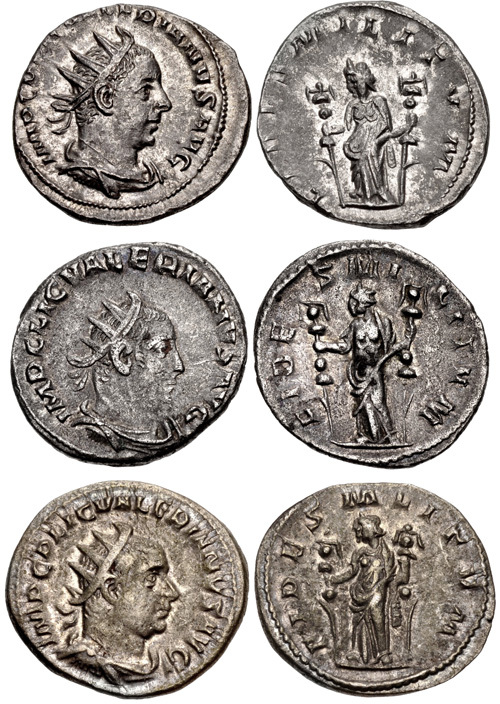 IMP C P LIC VALERIANVS AVG, radiate, draped, and cuirassed bust right / FIDES MLITVM (sic) , Fides standing left, holding standard in each hand. MIR 36, 22d var. (rev. legend); RIC V 89 var. (same); Cunetio 441 var. (same). Good VF, toned. An example of a die-sinker’s error in the reverse legend.